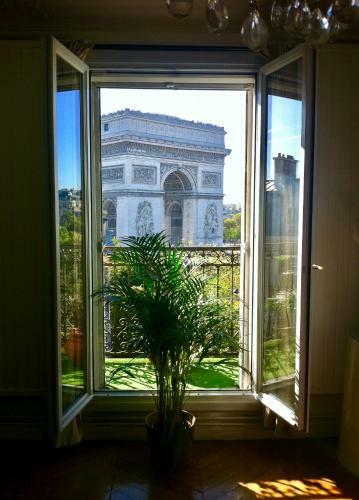 Located in Paris, Apartment Triomphe Lodge offers a view of the Arc de Triomphe and is only 200 metres from the monument. This self-catering accommodation features free WiFi and is set on the top floor of the building. Avenue des Champs-Elysées is 1.2 km away. With wooden floors and crystal chandeliers, the accommodation will provide you with satellite TV and a balcony. Complete with a microwave, the dining area also has an oven and a refrigerator. Featuring a shower, private bathrooms also come with a bath. Extras include cable channels. If you feel like visiting the surroundings, check out Eiffel Tower (1.9 km) and Gare de Paris-Saint-Lazare (2.2 km). Paris - Charles de Gaulle Airport is located 24 km away. This elegant apartment features parquet flooring, crystal chandeliers and a balcony with views of the Arc de Triomphe. Please note that gas consumption of up to 200 kw per week in included. Further consumption will be subject to an extra charge. Rate: € 290.00 ... € 400.00; select dates below to get current rates.